When someone you care about is under the weather send them our Get Well Soon My Friend Get Well hamper filled with thoughtful and tasty ways to brighten their day. 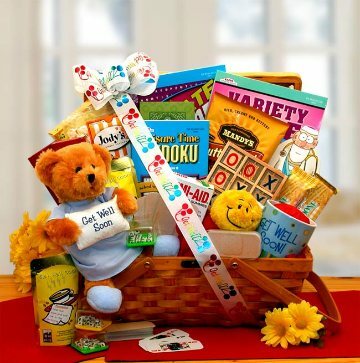 We've included an adorable soft teddy bear sending his get well soon wishes along with healing green tea, fun gummy bears, an assortment of puzzle books and more. A sure way to brighten their day and send them on the mend. This gift includes the following: Plush get well teddy bear, Get Well Soon coffee mug, Band-aide shaped playing cards, Get Well soon Dr theme Gummy bears, Band aide shaped gummy band aids, Tic-Tac-Toe wooden game set, word boggle game cube, cream filled grandmas sandwich cookies, Old fashioned cream caramels, Get Well Soon coffee, Relaxable smiley face stress ball, White cheddar popcorn, Sudoku puzzle book, Variety puzzle book, word search puzzle book, green tea, sweet-n-salty snack mix, arranged in a honey stained willow hamper and topped with a get well soon theme bow. Measures 15" long by 11"wide and 14" tall complete.